FFT helps to solve different esthetic and cosmetic skin problems which have earlier seemed to be complicated enough to be successfully dealt with. For example, tightening the skin on one’s face, neck and hands, treatment of scars and skin hyperpigmentation. The unique character of the FFT method consists in the synthesis of collagen and elastin in the deepest skin layers. Laser beam induces an array (fractions) of microscopic thermal wounds (punctures) in the skin, in the result of which cone-shaped treatment zones are created. The width and depth of treatment zones are measured in microns. Surface layers of epidermis suffer minimal damage, the whole process of coagulation takes place in deeper skin layers. In the course of one procedure, 15-25% of skin is treated with FFT, while those skin cells which remain untouched by FFT start reproducing actively and restoring (treating) the damaged area. In the result, new skin tissue resurfaces. New synthesized collagen and elastin tighten the skin. 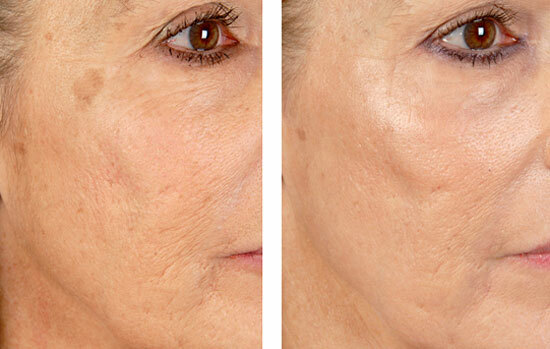 After the procedure, a basal layer of epidermis completely restores within 24 hours. Damaged epidermis cells flake off the skin within 2 weeks. Unlike traditional IPL and FPL photorejuvenation with the help of a pulsed light, FFT is always selective and controllable, which makes it a successful and safe method that can be applied on delicate areas, for example, around one’s eyes. FFT is suitable for all skin types. There are no limitations based on the colour of one’s skin, its thickness, or sensibility. Protective capabilities of the skin are preserved. There is no need for long-term application of protecting and restoring masks. FFT is an effective means for eliminating such signs of aging as loose wrinkled skin (excluding deep expression wrinkles), dull and lifeless complexion, large skin pores, etc. FFT is an effective controllable means of skin rejuvenation with a low risk of complications and a minimum recovery period. Facial skin becomes firmer and more elastic. The complexion becomes younger and brighter. Skin rejuvenation with the help of FFT leaves an amazing long-term effect. FFT doesn’t produce the effect of unnaturally tight-looking skin. FFT can also be administered to those people, for whom plastic surgery and chemical peel are contraindicated. In order to achieve the best result, it is recommended to undergo a course of treatment consisting of 2-3 procedures with an interval of 4-5 weeks. The treatment course should be repeated once a year. In the CleanLine clinic, this unique method of skin rejuvenation has been widely and successfully used for over two years already. FFT is an effective method for treating pigment spots, caused by a frequent exposure to the sun, as well as the treatment for melasma (excess production of the skin pigment which may result from hormonal changes taking place in female organism). In the result of FFT, skin rejuvenates, while hyperpigmentation in the deep dermal layers disintegrates and simply grows out. FFT is used for remodeling skin in the areas with stretch marks. In the result, the stretch marks and the skin tone even out, making striae almost invisible. In order for the treatment to be effective, striae must be at least one year old (light in colour, not purple or reddish). FFT is used for the fractional treatment of the rough scar tissue. Scars may be removed in any area of the body. FFT is not suitable for the treatment of keloidal scars. Post-acne skin, or acne scars – crater-like scars get smoothed out by means of stimulation of healthy skin growth in the scarred area. The prerequisite for acne treatment is that acne has been cured and there are no areas of inflammation. On the same and on the following day the treated area might feel a little irritated, like a mild sunburn. The skin will go red, slightly puffy, you might feel hot or chilly, sleepy, there might be a slight fever. On the next day these symptoms should disappear, and a crust will form over the treated area. The skin will go darker. The crust will flake off withing 14 days. It is recommended to drink a lot of liquid. Do not put ice on the skin. Do not wash skin for 2-3 days. You can use make-up on the 3rd day after the procedure, the skin will not need any special medical care. You should use sun protection and/or moisturizing creams. You should avoid direct sun, using a solarium, spray tan and self-tanning creams within 1 month after the procedure. It is recommended to use sun protection cream with SPF 30 (at least).